We checked out what’s NEW at Disney’s Hollywood Studios, Pop Century, and Art of Animation! We shared some tips on planning for the 2018 Epcot Food and Wine Festival. We checked out the ESPN Club at Disney’s BoardWalk! New menu items were announced for the 2018 Swan and Dolphin Food and Wine Classic! Check out the new holiday merchandise at Disney World. We have details on the July Burger of the Month at The Edison. The Lighthouse Sandwich is back on the menu at Columbia Harbour House! 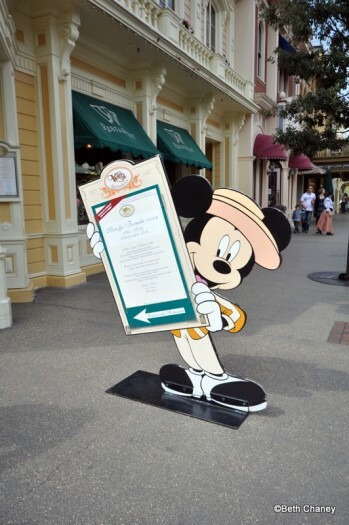 Le Rendez-vous Gourmand Food and Wine Festival is returning to Disneyland Paris. We know what Disney World restaurants are participating in Orlando Magical Dining Month! Check out where to find Spiked Dole Whip at Disney World! We have details on a VERY limited-time ‘Ant-Man and the Wasp’-inspired menu at Jock Lindsey’s Hangar Bar! 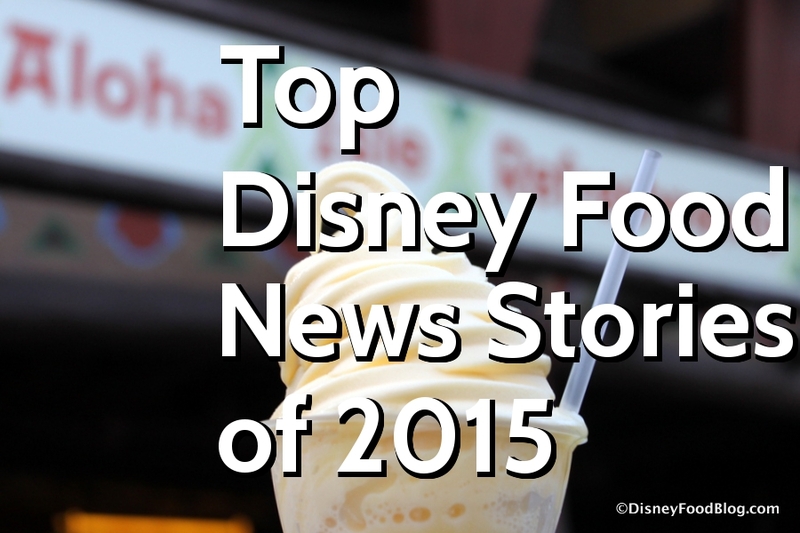 You can get your edible cookie dough fix at Disney World! 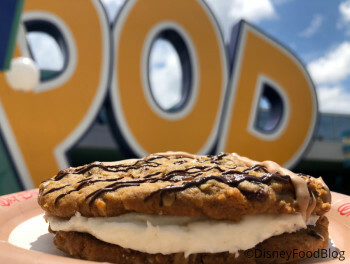 You need to check out this Oatmeal Cookie Sandwich at Pop Century. Toy Story Land Passholder Playtime opened for reservations…and promptly sold out! We shared some tips on Disney World Resort Hotel activities for the whole family. How many days should you plan to attend the Epcot Food and Wine Festival? We shared some tips. The Dole Whip Donut returned to Disneyland. We have all the details on the newest color craze at Disney World – Iridescent everything! Boozy Beignets are now on the menu at Port Orleans French Quarter. Check out what’s new and what’s returning for the holiday season at Disney World! Two new snacks debuted on the menu at Golden Oak Outpost in the Magic Kingdom. Another unicorn cupcake has been spotted at Disney World! We reviewed everything on the breakfast menu at Woody’s Lunch Box in Toy Story Land. A Disney World employee died in an accident at Pop Century. New DFB YouTube videos: Things You’d Never Think You’d Need at Disney World, Hollywood Studios Food Tour, Part 2, Best New Eats in Disney This Week, and Disney World Myths Debunked. We can hardly contain our excitement around here because we are just DAYS away from the start of the 2015 Epcot Food and Wine Festival! 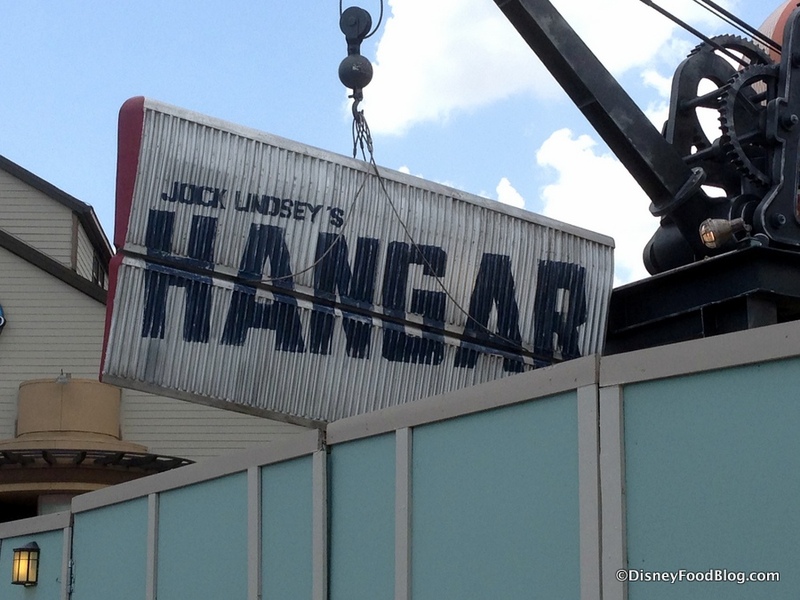 It was another week full of big news stories including an opening date for Jock Lindsey’s Hangar Bar and a big change to the popcorn at the Disney theme parks! Jock Lindsey’s Hangar Bar is opening September 22 in Downtown Disney! The 2015 Epcot Food and Wine Festival is just around the corner! Check out some special deals here on DFB! We have more updates about Disney Springs including Walt’s Restaurant and the Neverland Tunnels. Reservations opened for the Merry & Bright Dessert Party and the Merry & Bright Dinner Reception during The Osborne Family Spectacle of Dancing Lights. Pop Secret was named the official popcorn at the Disney Parks! A “magical foodie experience” featuring Walt Disney World food is headed to London! Our new #OnTheList series continues with the secret drink menu at the Cove Bar in Disney California Adventure! We review Les Chefs De France in Epcot’s France pavilion. Thanks to Beth Chaney of the blog 990 Square for this fun visit to Walt’s, An American Restaurant on Main Street USA in Disneyland Paris! Take it away, Beth! Before we left for France, I had one dream in my head for our visit to Disneyland Paris — to eat at Walt’s on Main Street and enjoy a glass of French wine! I was worried that this wouldn’t work out because I had a really hard time figuring out the Disneyland Paris dining reservation system (it seemed to be it was only available to onsite guests), but apparently someone sent a little pixie dust my way and we were lucky enough to score a late lunch walk up seating! Walt’s is located right on Main Street USA, halfway between the park entrance and the castle. 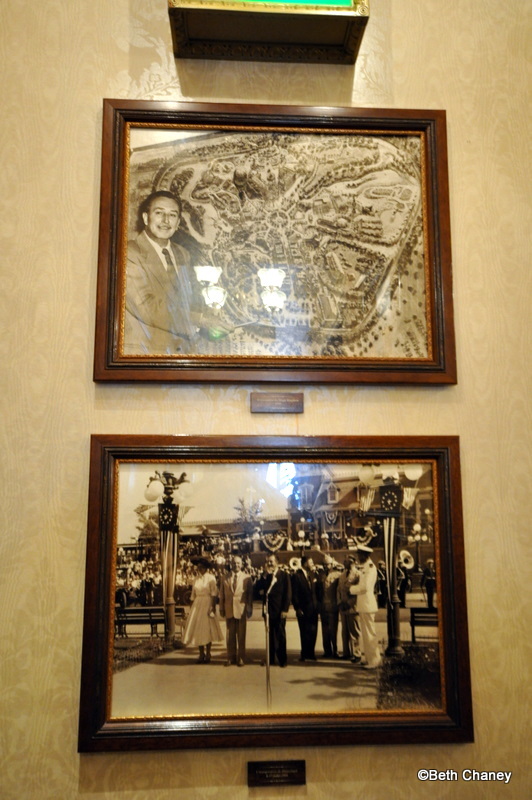 The entryway to the restaurant is located right off Main Street USA and is themed in the classic Victorian Main Street USA style, with references to Walt’s life. 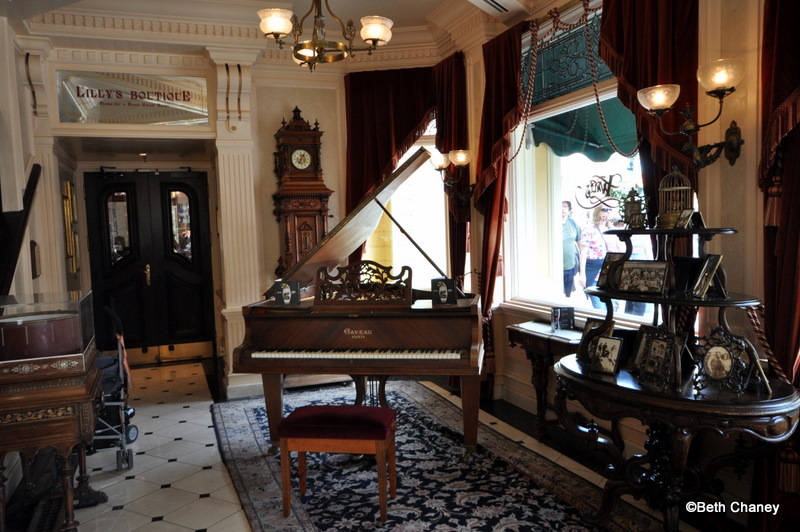 There is an old fashioned piano, a fancy elevator, and and entrance to a shop called Lillian’s in honor of Walt’s wife. 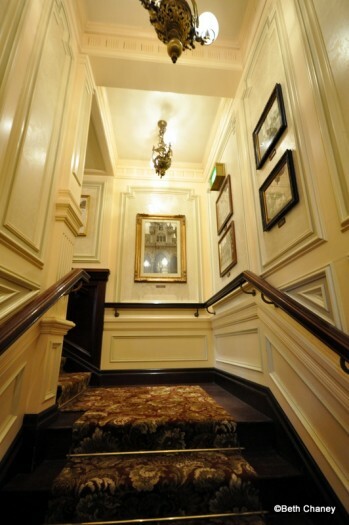 As you head to the dining room on the second floor, you go up a staircase that documents historic moments in Walt’s life and in the building of the Walt Disney Company and Disneyland. I really enjoyed stopping to look at each of these pictures showing how the company was created. The biggest piece of Disney food news this week is that the 2011 Wine & Dine Half-Marathon registration opened this week! This race will kick off the 2011 Epcot Food and Wine Festival. The Passporter Moms Podcast featured three Disney Food Blog contributors this week — Erin Foster, our Disney Food for Families columnist; Kim LaPaglia, Disney Food Blog contributor and behind-the-scenes superstar; and Bernie Edwards, Disney Food Blog contributor (and my Aquaduck partner)! Check out their report (including reviewing the food!) on the new Wild Africa Trek tour in Disney’s Animal Kingdom. Speaking of podcasts, I had the chance to record with the WDW Today Podcast again! This week, we covered those 2011 Disney Dining Plan changes! Listen here! WDW for Grownups shows us around Raglan Road in Downtown Disney Orlando! Eating (and Drinking) Around WDW channels Andrew Zimmern as he makes the chef’s recipe for Black Bean Spare Ribs with Green Onion, presented at the 2010 Epcot Food and Wine Festival. 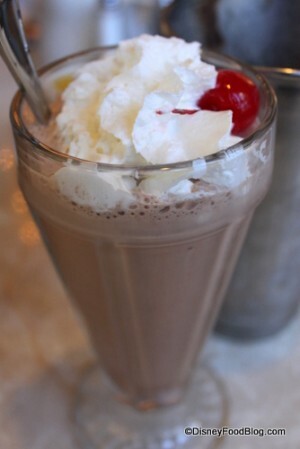 Main Street Gazette discovers a bit more about the recipe for coca-cola in Epcot! Babes in Disneyland says a resounding no to the new kids meal pizzas at Disneyland’s Village Haus. English Disney Blog reviews Walt’s Restaurant in Disneyland Paris! Kevin Kidney reveals the authentic recipe for the original Chicken of the Sea Tunaburger in Disneyland. But the best part of the post is the picture of Kevin with said Tunaburger.